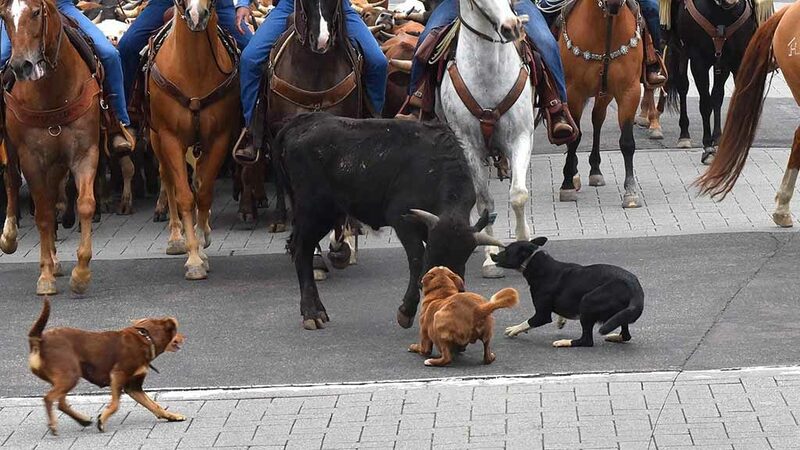 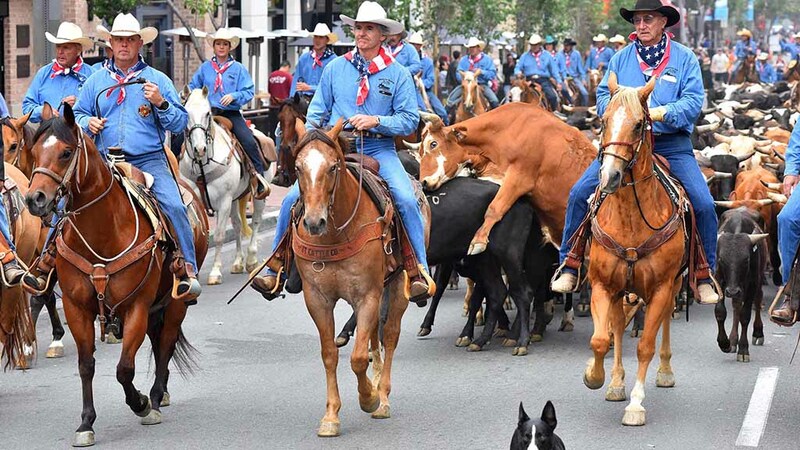 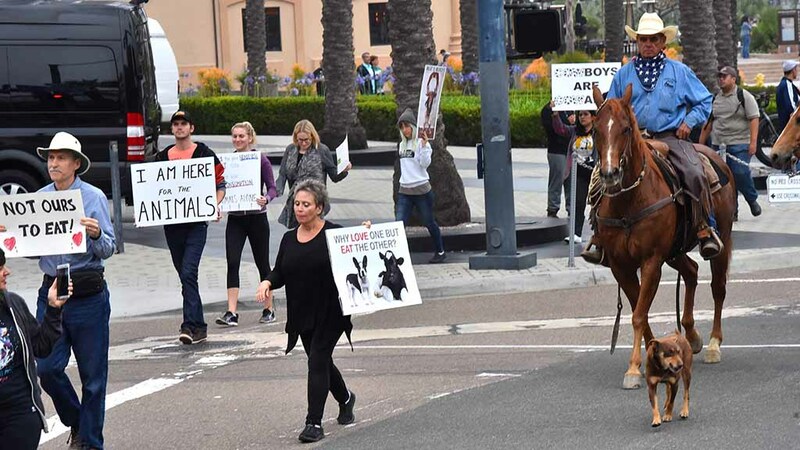 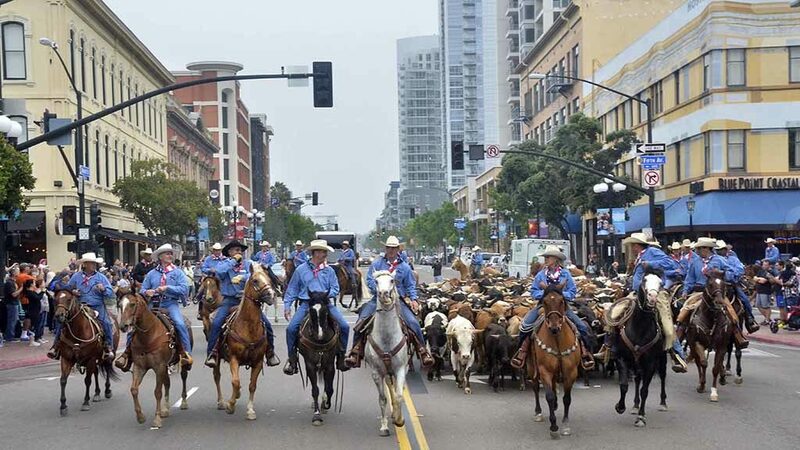 Dogs once again proved they are a cowboy’s best friend as they steered 200 cows through the streets of downtown San Diego Saturday without incident. 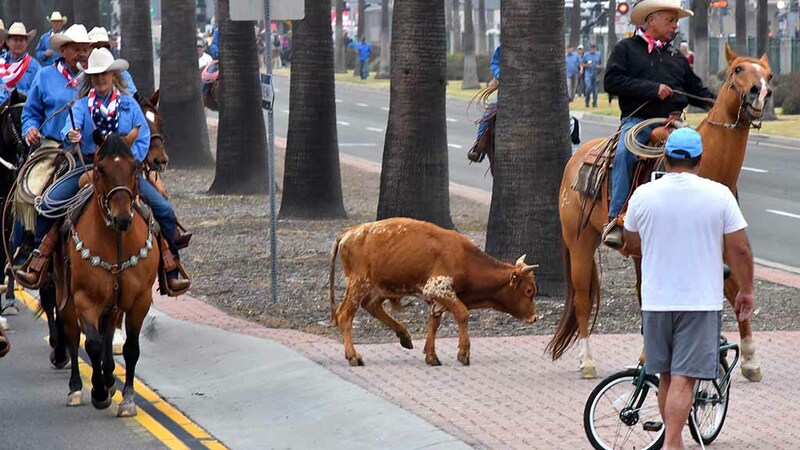 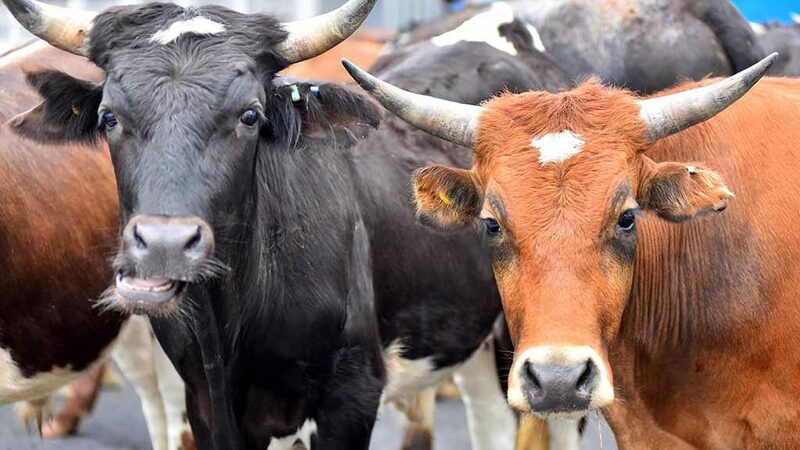 On several occasions, frisky cows strayed out of formation during a cattle drive that looped through downtown in a tip of the hat to the 150th anniversary of the Gaslamp Quarter and the opening of San Diego County Fair. 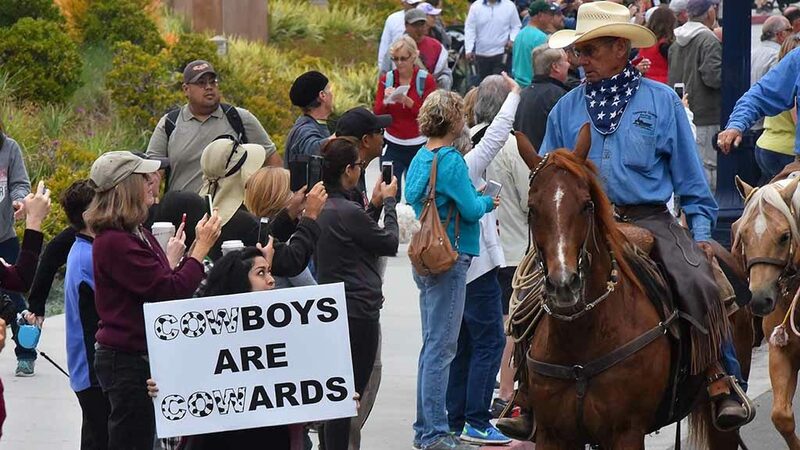 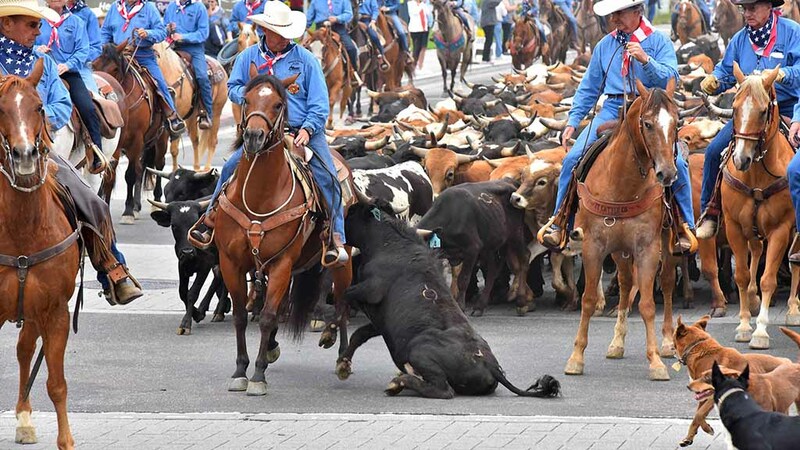 “The dogs have the most control if something goes wrong,” said Sharon Tavaglione, one of about 40 cowboys and cowgirls who surrounded the cattle that included American Longhorns. 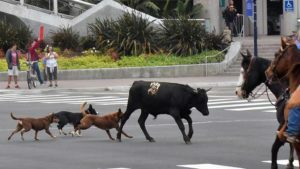 And indeed several herding dogs quickly rounded up the wayward 700-pound cows on the early morning four-mile romp, averting problems. 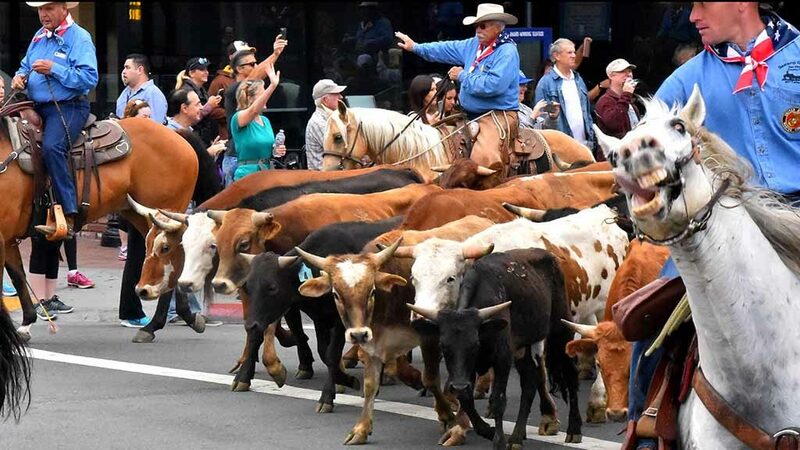 “They’re pretty quiet,” Tavaglione said before the ride of the Corriente cattle, which are used in rodeos in steer roping competitions. 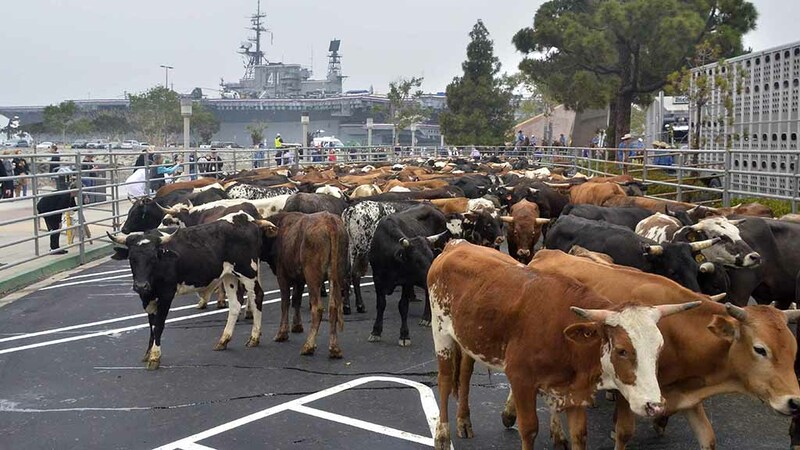 The older cows are used to traveling in trucks and doing promotional events, including ones in Pomona, Huntington Beach and Costa Mesa. 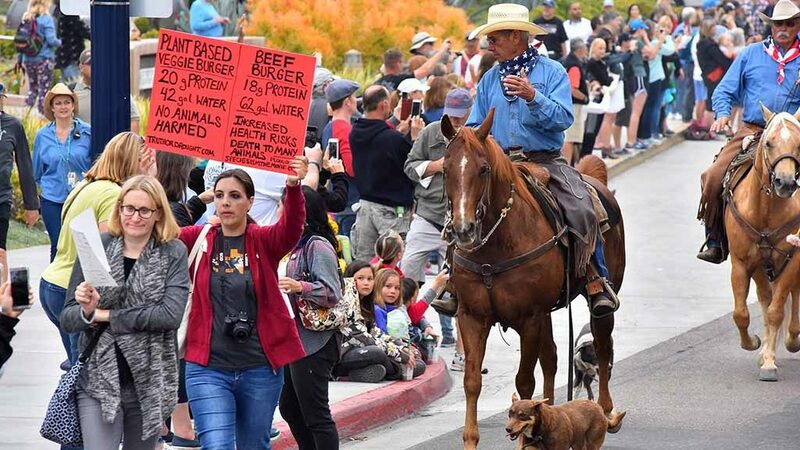 About a dozen animal activists walked along the cattle drive, urging people not to eat beef and calling for humane treatment of animals. 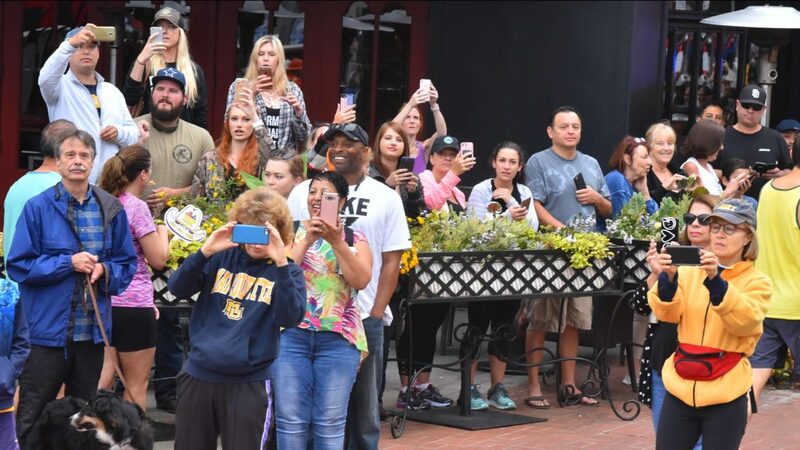 Hundreds of curious people lined Harbor Drive, Fifth Avenue and Market Street to get photos and video to document the unusual event. 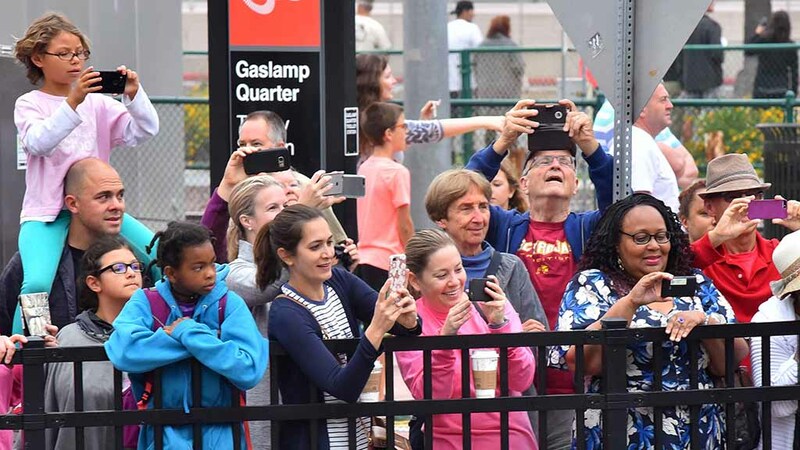 “I’ve never seen anything like that before,” said onlooker Ruth Lucca. 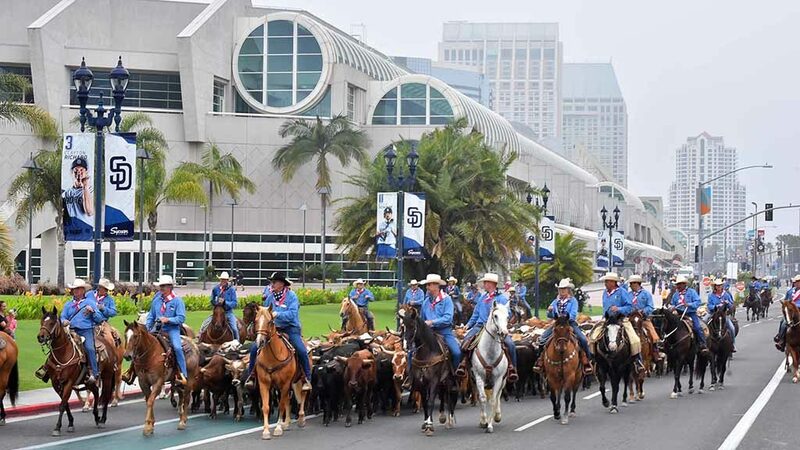 “Cattle coming down the main street right in front of the Cheesecake Factory and the Grand Hyatt. Really? 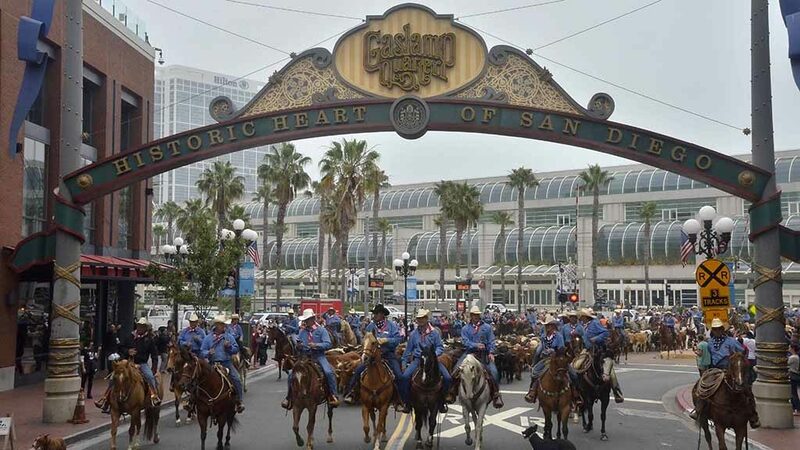 “They really had it corralled very well,” added Lucca, who already made her first trip to the fair Friday night after recently moving to San Diego. 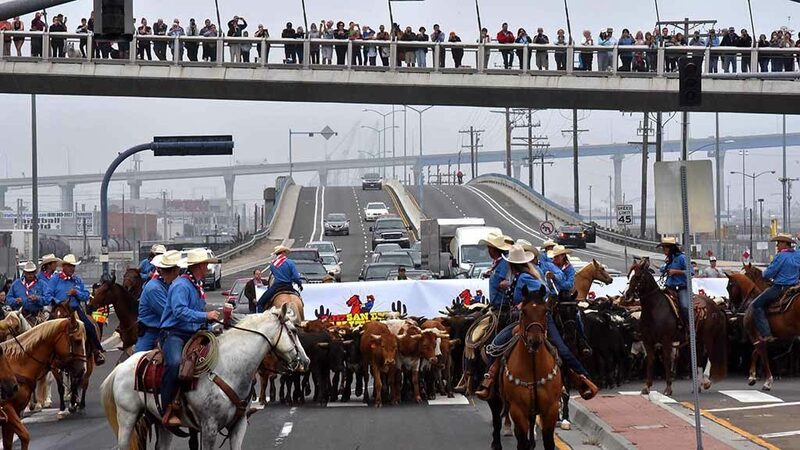 ’ progress and to avoid the cattle standing beside the track as the trolley passed. 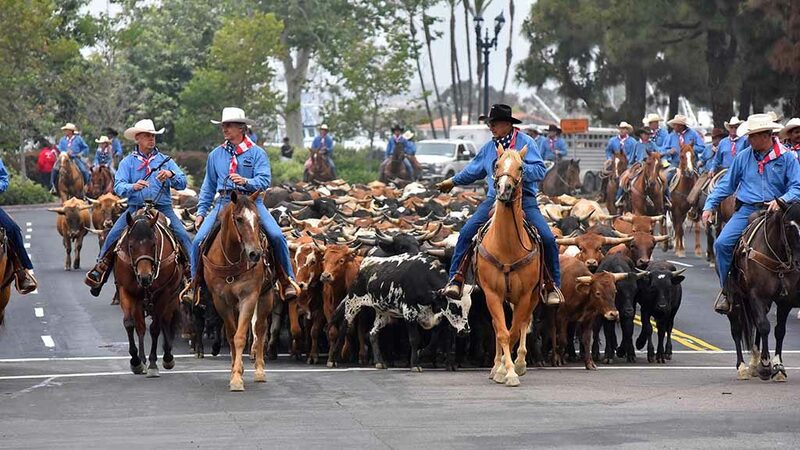 Which is better than what happened in Costa Mesa. 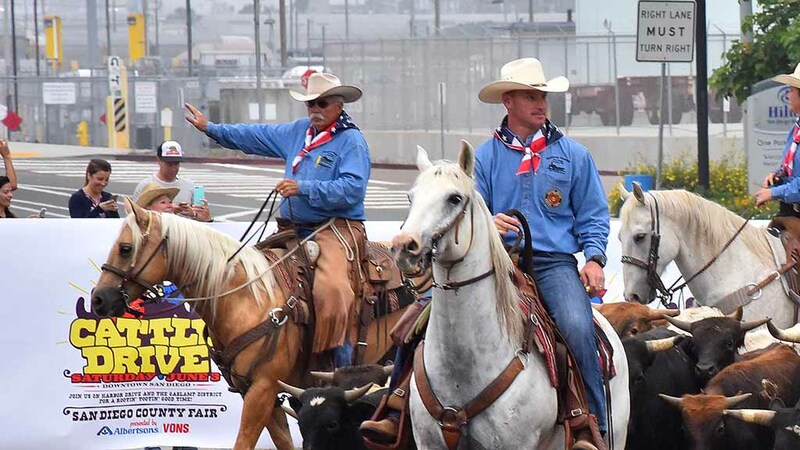 The San Diego County Fair runs through Tuesday, July 4; it is closed the first four Mondays and the first three Tuesdays. 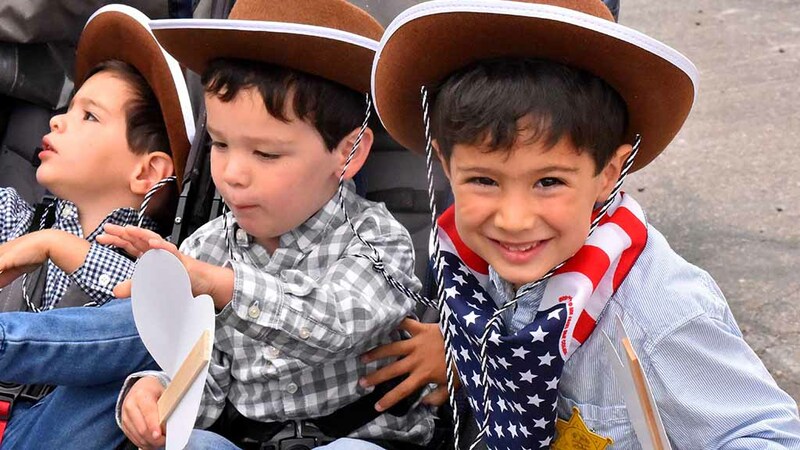 The fair will feature a Wild West saloon, numerous Western-themed educational and historic exhibits and country music. 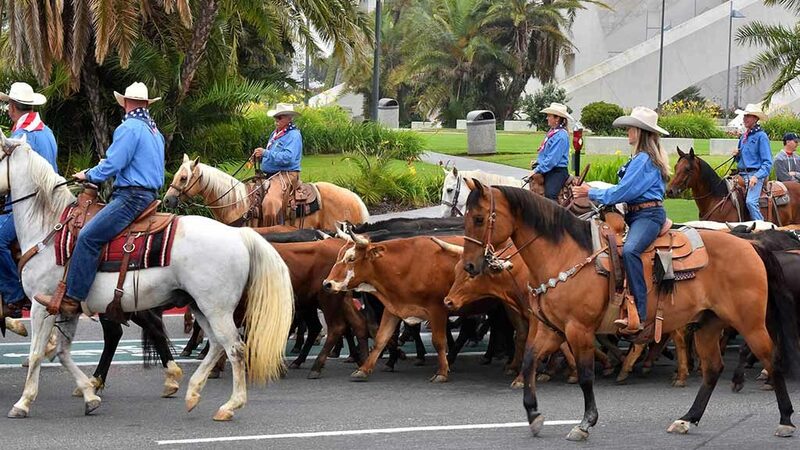 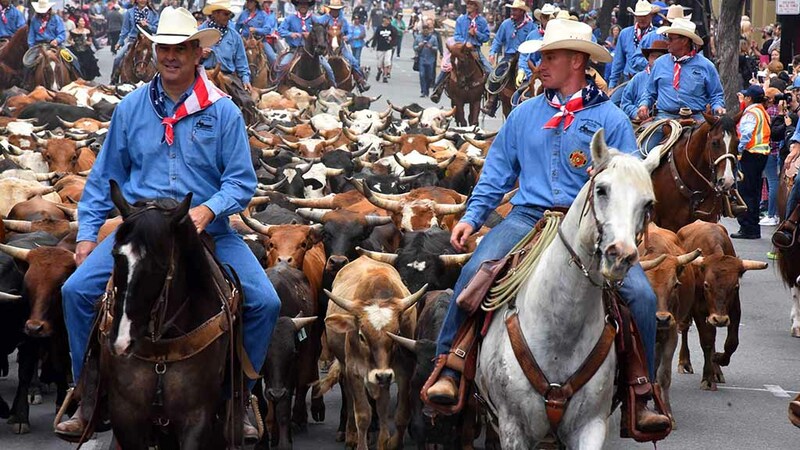 Cowboys and cowgirls led 200 cows through the streets of downtown San Diego. Photo by Chris Stone. 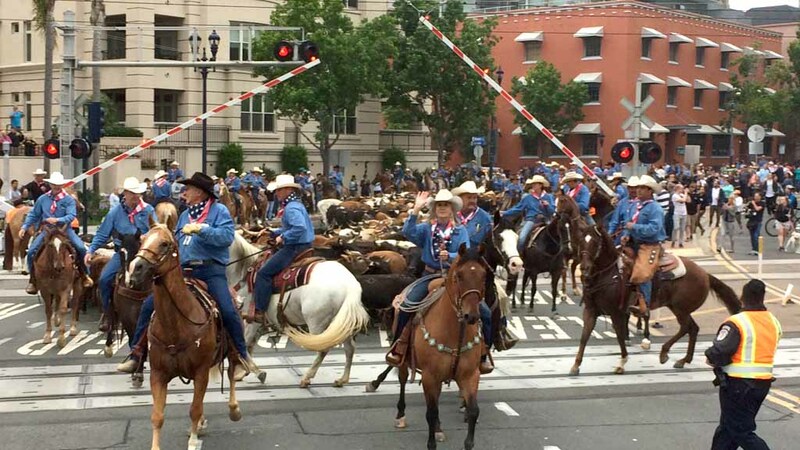 Cowboys and cowgirls led 200 cows down Market Street. 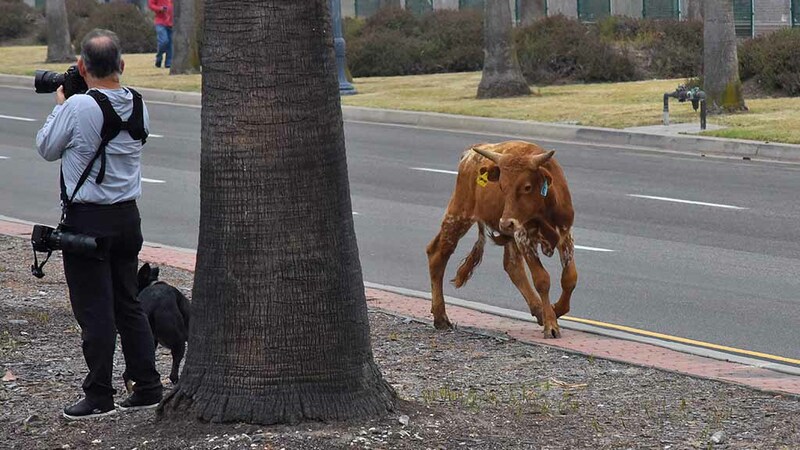 Photo by Chris Stone.